Click the image to get to the course. React is built around components, not templates. You create a component by calling the createClass method on the React object — the entry point into the library. The createClass method takes one argument, the specification object. This object contains all the methods for the given component class. The most important one is the render() method, which is triggered when the component is ready to be drawn on the page. Within it, you’ll return a description of what you want React to render on the page. In the case above, we simply want it to render a button. Note: The render function is a description of the UI at any given time. So if the data within it changes, React will take care of updating the UI accordingly. But for now, you can simply think of it as just HTML/XML with a few extra abilities. Note: You can write JSX in both .js and .jsx files, but you have to transform it from JSX to React.JS with a transpiler or pre-processor. If you want to nest multiple components together, you do this within the return statement of the render function, like we’re doing below, where we’re nesting ButtonForm within the App component. At this point the App component owns the ButtonForm component. It’s the type of parent-child relationship you probably recognize from HTML. The React.render() method you see below the two components takes care of ‘kickstarting’ the rendering, and renders the root component (in this case App) into the DOM in the specified container. There are two types of data in React; props and state. The difference between the two is a bit tricky to understand in the beginning, at least conceptually. But once you start coding, you’ll quickly manage to separate the two from each other. The key difference is that state is private and can be changed from within the component itself. Props are external, and not controlled by the component itself. It’s passed down from components higher up the hierarchy, whom also control the data. So while a component can not change its own props directly (it can do it indirectly, but let’s save that for later), it can change its own state. We’ll start off by looking a bit closer on props, as it forces us to understand Reacts one directional data flow, which also is critical to know about. The way to hand this data to a component’s props looks a lot like how you would specify an HTML element’s attribute. Once the App component is initialized like this, it can access the BUTTONTEXT variable through this.props.text. However, it can not change the data directly. From the components perspective, its props are immutable. Its just something its initialized with. The props are being passed into the App component in React.render(). The App component can now access theBUTTONTEXT variable through this.props.text; it can also pass the data down to its own children, as it does. It initializes the ButtonForm component with the same props it got itself; we’re simply passing the data down the chain. When the data reaches the ButtonForm component, it’s found its destination, as it’s rendered as the descrption text in the h3-tag above the button. This way of passing props down the chain — from parent to child — is how data is distributed in React. It’s passed down the hierarchy, and it’s passed as props. The other way of storing data in React is in the component’s state. And unlike props — which are immutable from the components perspective — the state is mutable. So if you want the data in your app to change — for example based on user interactions — it must be stored in a component’s state somewhere in the app. As state is private and owned by one component only, it can’t be passed down the chain to child components. If you want to pass the data down to a child, you’ll have to pass is as a props. To initialize the state simply pass a getInitialState() to the component, and return whatever state you want your component to be initialized with. To modify the state, simply call this.setState(), passing in the new state as the argument. This snippet also force you to get familiar with the Reacts event system, but don’t worry, it’s very simple. We hook an event listener onto the button, listening for the onClick event. When this is triggered, we call the handleClick function, which is available through the this keyword. The handleClick function then calls this.setState() which toggle the active variable between true & false. Note: React’s events are synthetic; they are cross browser wrappers around the browser’s native events, meaning that the library makes sure that your chosen event works identically across all browsers. Where should the state live? You should try and keep as few stateful components as possible, and also minimize the amount of data in the state. If components further down the hierarchy need access to the data from the state, simply pass the data down as props. Your stateful components are usually higher level, while the stateless are lower level. Find a common owner component (a single component above all the components that need the state in the hierarchy). Either the common owner or another component higher up in the hierarchy should own the state. We’ve talked a lot about how data only flows one way in React; from parent to child. That’s not entirely true, as it’s possible to add an inverse data flow. You’ll need this when a component deep into the hierarchy need to change its parent’s state. Below is an example of how a button click in the ButtonForm component trigger a state change in the App component above it, as it can access the onUserClick function. As you can see, we’re simply passing down the onUserClick method as a props, enabling the ButtonForm component to reach up to the App component, and trigger one of its methods. Sometimes you might want to reach into the DOM and do some changes, but not necessarily involve state or props. In these situations, you’ll need to grab the node of your choice. Luckily, React provides a handy way of grabbing DOM nodes. Simply call React.findDOMNode(component), passing in the component of your choice. From within the component rendering the input tag above, you can reference the input field through this.refs.textField. This will result in the input text field being focused on when you click the button. There are of course much more to learn about React, but if you understand all the concepts above, you know enough to start building React apps. So we’ll stop here. A good next step for you would be to complete this exercise, in which you’ll create a simple Todo list application. The exercise is the first one in the React.JS for Beginners course, which I’m arranging in New York next week. 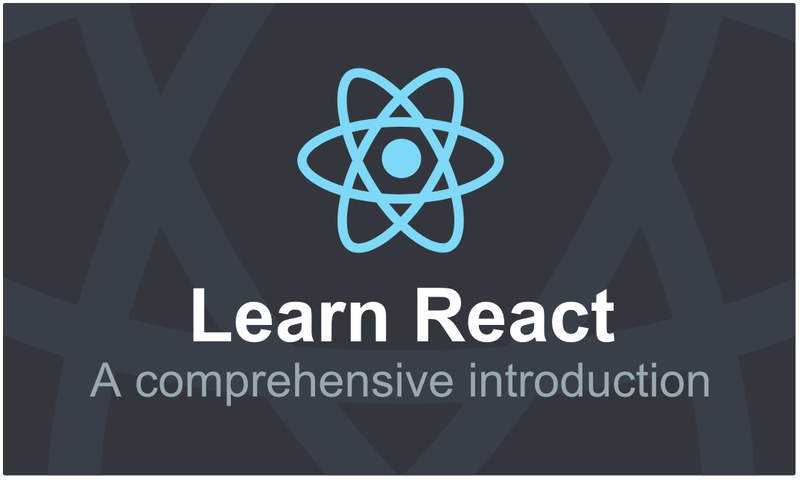 If you follow up with exercise 2 and 3 in the course repos, you’ll be a React pro in no time! Thanks for reading! My name is Per Borgen and I mostly write about learning new stuff. Feel free to reach out to me if you have and questions or would like to connect, either through Twitter, GitHub or just plain old email: perhborgen@gmail.com.